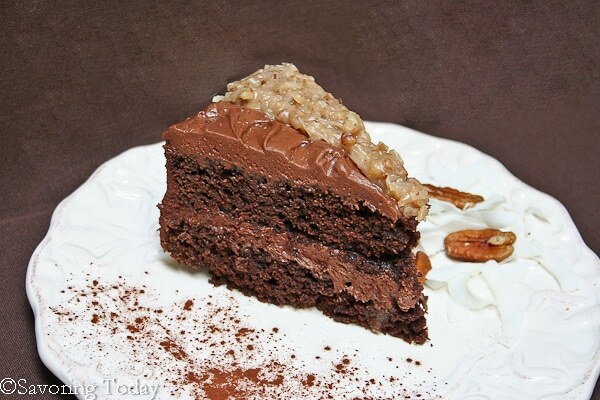 German Chocolate is the favored cake of two in our household, but the least favored of two others. We do not indulge in dessert often, birthdays being the exception. In order to honor birthday wishes and still include everyone in a celebratory cake, this “halvsies” cake has become a standard that suits everyone. 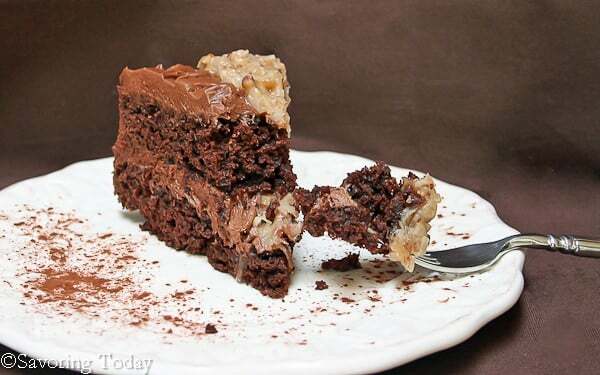 Ghirardelli Grand Fudge Cake is a fantastic base for the classic Coconut-Pecan Frosting and of course, it marries well with Ghirardelli Buttercream Frosting. By now I am sure you’ve noticed I am more cook than baker, so it should be no surprise that the photos reveal that my cake fell; it was still absolutely delicious, so that is what we will focus on. My lack of passion for baking and living at altitude does not help with delicate baked items, but I get by. 😉 Although I only frost half the cake with each one, I do not reduce the frosting recipes—not only is it hard to measure half an egg yolk it is easy to use the leftover frosting for graham cracker treats. It has been a whirlwind birthday season at our house with four cakes in just 7 weeks, Ghirardelli Grand Fudge Cake with Coconut-Pecan and Chocolate Buttercream Frosting was a delightfully sumptuous finish. Preheat oven to 350º. Grease and lightly flour two 9-inch round cake pans or place a round of parchment in the bottom of each cake pan and butter the sides. In a medium bowl, combine flour, cocoa, baking powder, baking soda, and salt, and set aside. In a large bowl, cream butter and sugar on medium-high speed until light and fluffy, about 4 minutes. Reduce speed to low, and add vanilla and eggs one at a time, scraping bowl after each addition. Alternately add flour mixture and milk (starting and ending with the flour mixture), while mixing on low speed. Continue to mix until smooth. Pour into prepared pans. 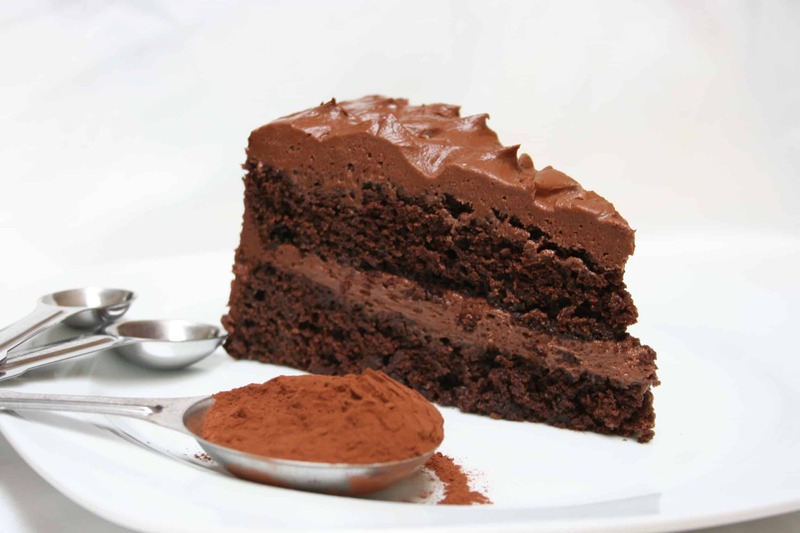 Bake for 30 to 35 minutes or until a cake tester inserted in the center of cake comes out clean. Cool completely on wire racks before frosting. Frosts tops and sides of two 9″ layers. In 2-quart saucepan, mix sugar, evaporated milk, butter and eggs yolks and cook over medium heat, while stirring, until mixture begins to bubble, approximately 12 minutes. Remove from heat and set aside. Mix coconut and pecans in a large bowl to break up any clumps of coconut. Pour caramel sauce over pecans and coconut, add vanilla, and stir until it reaches spreading consistency (it will thicken as it cools). Cool completely before frosting cake. 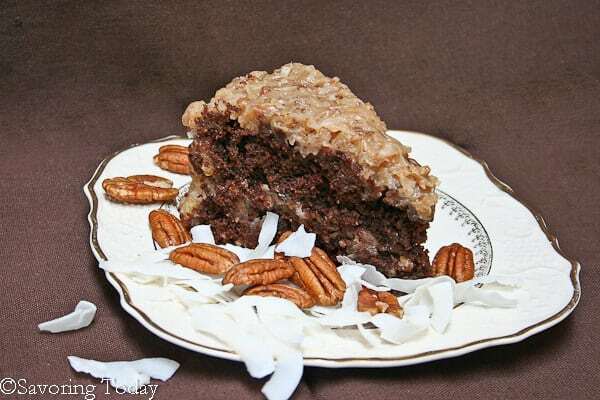 Note: Pecan pieces can be toasted in a 350° oven for 5 minutes until aromatic, before adding to the frosting, if desired. In a bowl, beat butter until light and fluffy. In a separate bowl, mix confectioner’s sugar with cocoa. Blend sugar mixture with butter alternately with milk, beating well after each addition. Beat until smooth. Blend in vanilla. Special Note: For leftover frosting, spread on graham crackers as a filling between two crackers. Place sandwiched grahams into a plastic bag and keep in the freezer. Allow to thaw for only a few minutes and enjoy! Looks absolutely divine! Anything Ghiradelli related must be delicious! Oh I’ve got to try this frosting!